While only one runner from Jackson County qualified for state cross country competition this season, that did not detract from the successes had by several Holton, Jackson Heights and Royal Valley runners this fall. Among the female runners in the county, there was much progress made throughout the season along with several strong debuts, leading to the following selections for The Holton Recorder’s All-County cross country team. Kaitlynn Little, sr., JHHS— A storied high school career came to an end this fall as Little ran in her final season with the Cobra cross country team and she certainly went out with a bang. With the exception of one meet (state), Little never finished outside the top 10 in any race and really picked things up after the opening meet. Following a seventh-place finish at the Holton invitational, the Jackson Heights runner then turned in three straight runner-up performances and followed that up by capturing two individual titles, including one in the regional meet. Little routinely turned in some of the best times of her career this season, breaking the 17-minute mark twice and clocking what coach Lyle Alley said was her best time ever of her four appearances at the Class 2A state cross country meet where she placed in the top 30 for the third time. While she could not claim a state medal, this All-League runner and four-time All-County selection leaves behind a legacy that Alley said is on par with some of the great runners in the Cobras’ storied history. “She’s placed herself up there in the history of Jackson Heights cross country as one of the better runners I’ve ever had. There’s no doubt about that,” Alley said. Kaytlyn Gooderl, jr., RVHS— Another runner with a coach who praised her work ethic, Gooderl came into the season as the Panthers’ top returning female runner. Gooderl certainly lived up to expectations early as she finished around the top 10 in the first six races of the season. That included a fourth-place finish at the Panthers’ home meet and an 11th-place finish at league, earning her All-League honors, which helped the Royal Valley girls place third at both meets. The junior runner finished in the top 15 in all but one meet this season and as part of a young core of runners who will be returning in 2015, she could be part of what coach Brad Alley said is a bright future for the RV girls cross country team. This is Gooderl’s second appearance on the All-County roster. Katie Hanshaw, fr., RVHS— Another young member of the talented Panthers team, Hanshaw did nothing but progress in her debut season. Starting out as a solid number two runner behind Gooderl, Hanshaw eventually caught up to and passed her teammate, leading the Panthers in the final three meets of the season. That strong finish included a 10th-place showing at the Big Seven meet to earn All-League honors, a runner-up finish at the Jackson Heights Invitational and a spot just outside the top 20 (and just outside state qualification) in a tough Class 4A regional meet. Hanshaw routinely lowered her times at each meet as well, cracking the 18-minute mark in the final three meets, and earned a spot on the All-County squad for the first time. Alexis Rieschick, so., JHHS— Behind Little, Rieschick was a rock as the number two runner for the Cobras this season. While they didn’t get to use that strong one-two punch for the good of the team (JH did not have enough members to qualify as a team in meets), that didn’t seem to slow Little or Rieschick down this season. Consistency was the name of the game for Rieschick as she finished in the top 12 in every meet Jackson Heights competed in this fall. That included a top-10 showing in the Royal Valley Invitational, a 12th-place finish at the NEKL meet in Horton that earned her All-League honors and a heartbreaking 11th-place finish at the regional meet, which saw her finish just one spot short of qualifying for the state meet. 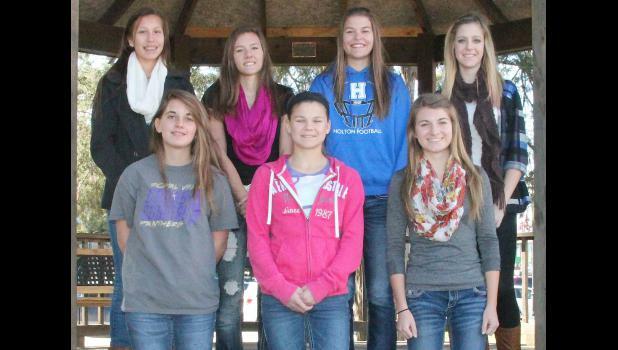 Rieschick is making her second consecutive appearance on the All-County cross country team. Tamo Thomas, fr., RVHS— After a couple of meets this season, Royal Valley’s strong duo eventually turned into a trio as Thomas turned in several solid performances and worked as the bridge that brought the Panthers closer and helped them pack it in tighter with the top two, leading to stronger team showings. Thomas was pretty strong on her own, too, as she turned in four top-20 performances in her five varsity meets this season, including a season best 10th-place finish at the Jackson Heights Invitational towards the end of the season. The young Panther runner also just missed out on All-League honors, though she is making her first appearance on the All-County roster. Emily Degenhardt, sr., HHS— In a season that saw several upperclassmen leading the charge for the Wildcats, Degenhardt took to that role for the girls team as the only senior on the roster. The senior stepped up in her final season of high school cross country and formed a strong nucleus with some young runners, including last year’s top runner Alex Myers. Degenhardt and Myers finished neck-and-neck through the first few meets of the season before the senior bumped things up a notch to close out the season and took on the lead runner role for the girls team, including a top-20 finish at the Big Seven meet, which nearly netted her All-League honors. In her final season, Degenhardt finished in the top-40 six times and had a season best ninth-place finish at the Royal Valley Invitational, earning her first ever selection to the All-County team. Alex Myers, so., HHS— Picking up where she left off a year ago, Myers came out strong for the Wildcats to begin the season, leading the girls team in the first four meets. That included back-to-back-to-back top 30 finishes, culminating in her finest performance at the RV Invitational, an eighth-place finish. Myers also finished just outside the top 20 in Big Seven League competition and this marks her second straight year being picked for the All-County squad. Honorable mention for the All-County team included Deasha Stewart (RVHS), Alexis Garcia (HHS) and Danyel Duryea (JHHS).